Our wide range of training programs was meticulously developed by leading explorers whose mission was to build communities of passionate scuba divers with globally coordinated diving activities. GUE educational programs enable divers to comfortably explore a wide range of possibilities, but the value of GUE training becomes even more pronounced when joining any of our far-reaching GUE communities or GUE projects. These activities offer many opportunities for social engagement and mutual support. A variety of specialized programs range from drysuit and diver propulsion vehicle (DPV) use, to rescue, photogrammetry and our immensely popular GUE Fundamentals course, which is one of the most emulated programs in the industry. GUE also maintains an unprecedented quality governance system which includes regular requalification for instructors, quality control feedback from every GUE diver, and certification renewal requirements, among many other industry-first initiatives. In support of the general diving industry, as well as our own programs, GUE produces a wide range of educational and support materials, including books, live presentations, diving and skills videos, and course presentation materials. GUE publishes a quarterly journal, Quest¸ which includes diverse articles on ecology, equipment and training, exploration, dive-related travel, and more. How the World Should Learn to Dive? Scuba diving can be a positive, exhilarating experience that changes lives. Unfortunately, far too many people have a very different—sometimes even negative—experience, due largely to the way scuba diver training is traditionally offered. To enjoy their time underwater, divers must be able to maintain their position in the water column and effortlessly perform many critical skills vital to their well-being and comfort (e.g., clearing a mask, exchanging a regulator, using efficient propulsion). Unfortunately, many new and even experienced divers will often not get a chance to properly develop these and other important skills. Even though these essential skills are presented in most classes, they are often viewed in isolation and are rarely linked together; they also aren’t rehearsed enough for divers to become proficient in or comfortable with them. For example, mask clearing is usually taught while kneeling on the bottom, and the skill is often considered passed when the trainee can perform it once (even if uncomfortable). GUE recognizes that dive skills aren’t just a checklist to be completed—mastery requires step-by-step progression. How do training programs fail divers? Isn’t all diver training the same? Many diving problems begin with a less-than-adequate amount of training time taught by inexperienced instructors, which results in divers who are unprepared, unsure of their skills, and uncomfortable in the water. Consequently, they will be unable to enjoy their diving experience. These problems are not necessarily related to lack of caring, as many dive educators work in dive shops filled with individuals who are passionate about diving. But these individuals have too many factors working against them and too few alternatives, since they are working from within an industry that largely views education as a means of selling diving equipment rather than as a discrete set of skills to be carefully cultivated. This is the backdrop upon which GUE began crafting unique, skill-focused programs where divers—where you, in a relatively limited time—can enjoy huge rewards and experience diving in an exciting new dimension. How can divers identify and fix these problems? How good are your skills? Your diving skills should be developed in proportion to the type of diving you pursue. For example, if you are a newly certified diver, the refinement you should expect will be very different from that of a cave or deep explorer. Yet, the list of important skills is much more similar than most people imagine. In fact, GUE’s training involves a “begin with the end in mind” approach that focuses upon the fundamental skills required of all divers, thus ensuring the development of a solid base of capacity. The primary categories useful for skill evaluation and refinement are stability, buoyancy, trim, balance, and propulsion. Advanced or technical divers often overestimate their capacity in these areas, so a regular review and practice of these performance objectives is useful for everyone. How do you measure stability? One of the most difficult skills in scuba diving is remaining still, since there are many influences on a diver’s position in the water. However, stability is a core requirement for all divers because it is difficult to do anything while unstable. Changes to equipment position, weight, and fit are important factors. Divers learning not to shift their bodies is also essential, but many divers unconsciously move their hands or other body parts ways that decrease stability and that can even cause environmental problems. While very new divers should move as little as possible, some movements are to be expected as they refine their skills. 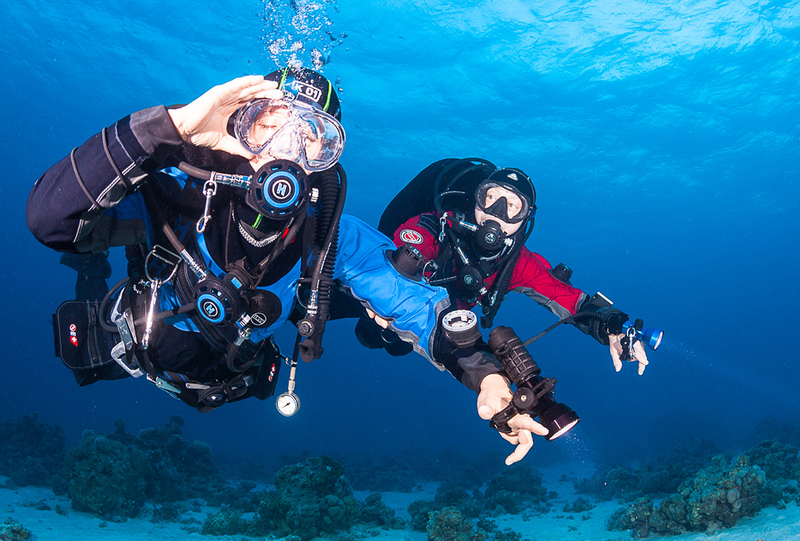 Experienced divers should move very little, and technical divers should be able to remain motionless. Buoyancy control and stability are normally refined in tandem, and improvement in one often leads to improvement in the other. All divers should work toward eliminating unintentional buoyancy changes (moving up or down), but some movement is normal. Recreational divers should be able to remain within a 1.5 m/5 ft, range, and advanced divers should move less than 1 m/3 ft. Divers with greater buoyancy changes risk damage to the environment, their equipment, and themselves, but such fluctuations will also compound the challenge of holding still because expanding or compressing gas in the BC will accelerate the effect, leading to an up/down or “yo-yo” effect. This refinement is particularly important as divers extend their dive times and get near or go beyond recreational limits. What are “trim” and “balance”? While horizontal (flat) trim is not desirable in every situation, what is always desirable is appropriate trim relative to the environment. 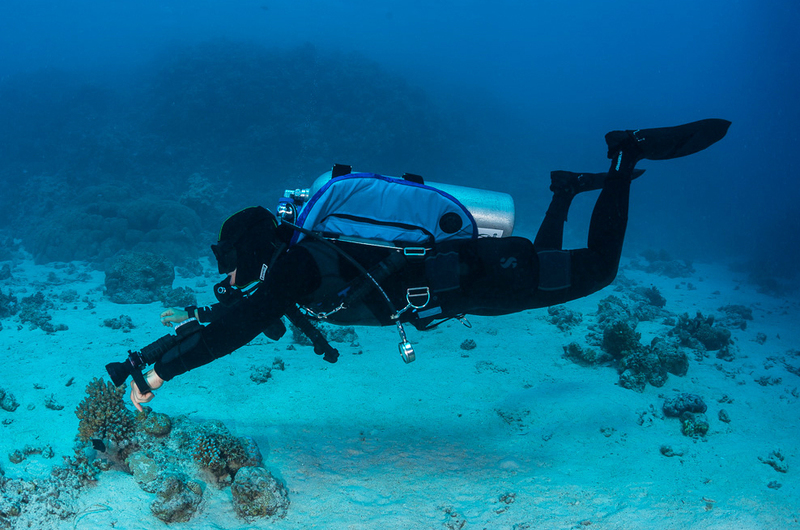 For example, divers following the contour of the bottom must adjust their positions according to changes in that environment (such as following a reef or moving inside a cave or wreck). Likewise, divers must remain aware of their left-to-right position and avoid using hands or fins to reposition. Proper trim and balance are achieved by conscious body positioning, equipment placement, and appropriate weighting. As with most worthwhile skills, perfecting these abilities takes time and practice. Why are trim and balance important? The clearest path toward an enjoyable activity is maximizing efficiency while minimizing effort. 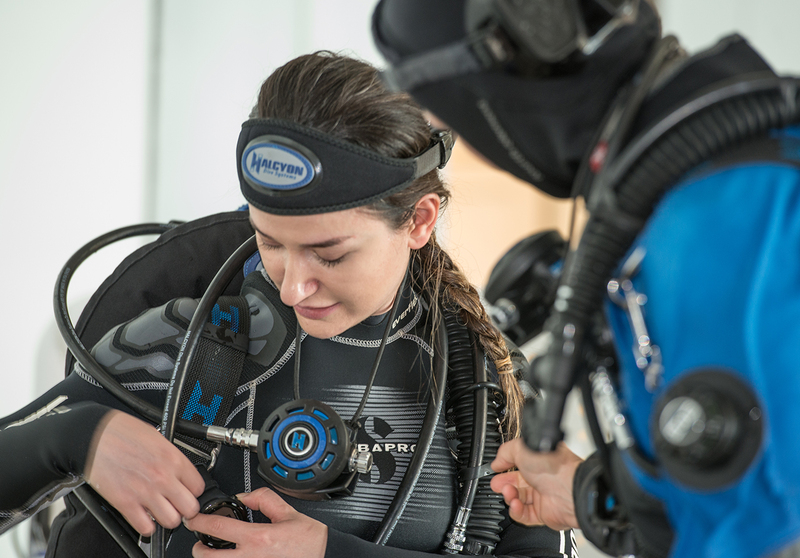 Divers with a streamlined configuration, in proper trim, and with good balance will be more stable, use less energy, and reduce gas consumption and their own stress. Not only does this allow them to extend their dives, but it also maximizes the fun of diving! Efficient divers are less apt to develop problems during their dives and are better able to move quickly when aiding a struggling teammate. Well-trained divers can clear and even remove their masks with little effort, without moving up or down, and while maintaining a flat, stable position in the water. They can move efficiently through the water by employing a variety of propulsion techniques to suit the environment. These divers are aware of their surroundings and can anticipate, avoid, and/or resolve any number of issues long before they escalate into problems. In short, they will enjoy the dive with little stress, having reinforced skills so that they are second nature. They simply have more FUN. Scrupulous care is taken in the selection and training of our instructors to ensure the best possible experience for all students. GUE instructors must possess exemplary diving skills and knowledge in addition to effective communication and teaching skills. Becoming a GUE instructor can be a long and demanding process, as is confirmed by the small group that has been able to reach the high bar we have set. This is not only due to the intense instructor requirements but also to the regular renewal and requalification requirements for all instructors. On a yearly basis, every GUE instructor must pass a fitness test and demonstrate both teaching and diving currency at the highest levels of their qualification. While this might seem obvious, it is one of many GUE innovations. In this case, GUE remains the only agency willing to accept the financial cost of fewer instructors while ensuring diving currency and capacity from their instructors. All GUE programs are carefully monitored by a thorough quality governance process—another GUE innovation—that queries 100% of our students and requires completion of the questionnaire before a certification card is issued. This quality governance process merges a quality control department that monitors and ensures compliance with all program standards and a quality assurance department that proactively attempts to identify and mitigate any weaknesses in GUE training programs. Another feature unique to GUE is a prohibition of the industry’s most common business development tool known as “crossovers”. The most common manner for growing an agency within the diving industry is to incorporate crossovers, whereby an instructor from another agency is quickly accorded status in the second agency. This process supports the financial return for the agency but works against quality and the benefit of the student taking the course. The GUE instructor training and renewal process support a small but growing family of instructors that displays an unusually rare enthusiasm for their students and an unwavering commitment to excellence for themselves. These individuals represent the core principles of the GUE organization, helping build a global set of communities that provide inspiration and support for your own personal adventure. GUE invests considerable resources into the development and maintenance of the highest quality instructors and diving courses in the industry. This extensive process is further supported by a Quality Governance Program that seeks to safeguard the quality and safety of all GUE-related diving activity. This program primarily monitors GUE courses and instructors but also strives to support safe diving practice within our communities. GUE’s focus on quality is supported by the following components: course and instructor reports, yearly instructor evaluations, instructor and diver requalification, comprehensive course completion forms, rigorous training, and procedural standards and detailed course performance metrics. A thorough complaint submission process solicits all forms of commentary to establish risks within the quality, efficiency, professionalism, or safety of GUE courses. Meanwhile, the Directors of Training and Quality Control are authorized to immediately suspend any individual to remedy risks to student safety. GUE quality control forms are requested from every GUE student and are required for certification card processing. These forms are confidential by default, though students may elect to share their comments with their instructor to allow more effective and timely feedback. At the end of each year, GUE carefully creates individual instructor quality reports that allow the instructor to identify their strongest and weakest areas in support of personal development. This data helps the organization to refine training programs, adjust instructor training courses, and personalize instructor requalification processes. Standardization is one of the most powerful forces in group collaboration, enhancing effectiveness, promoting more efficient learning, and supporting logistically complex activities. Because of this, GUE training programs and activities require a standard equipment configuration. GUE’s standardized base equipment configuration adheres to our “begin with the end in mind” philosophy. Not only will equipment operation and the related procedures learned in the first GUE course follow divers for the rest of their diving careers, but the modular system removes the need for gear replacement as divers progress, allowing them to add components as required for advanced applications. 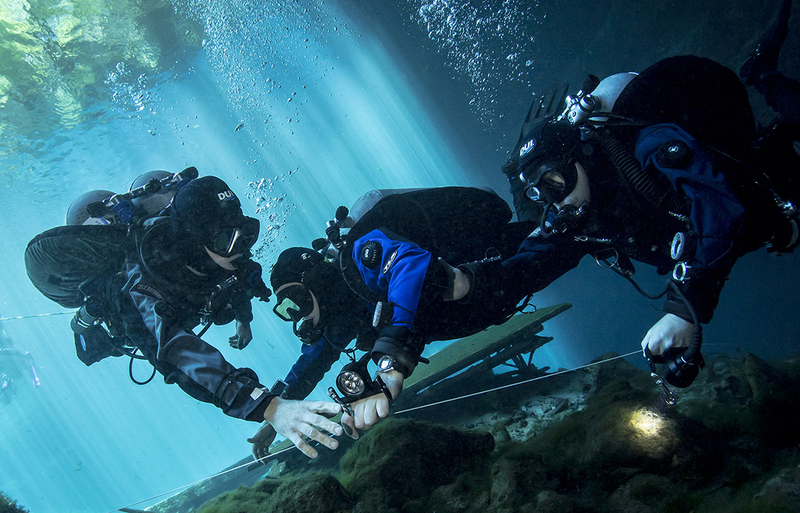 From day one, divers will practice in equipment configurations used by leading explorers. In addition to supporting muscle memory, team compatibility, and familiarity, the GUE equipment configuration is a tested and proven no-nonsense system that emphasizes minimalism, streamlining, and reliability. If this equipment is good enough to support some of the most advanced and exploratory dives done on the planet, it is good enough for any diver, anywhere! 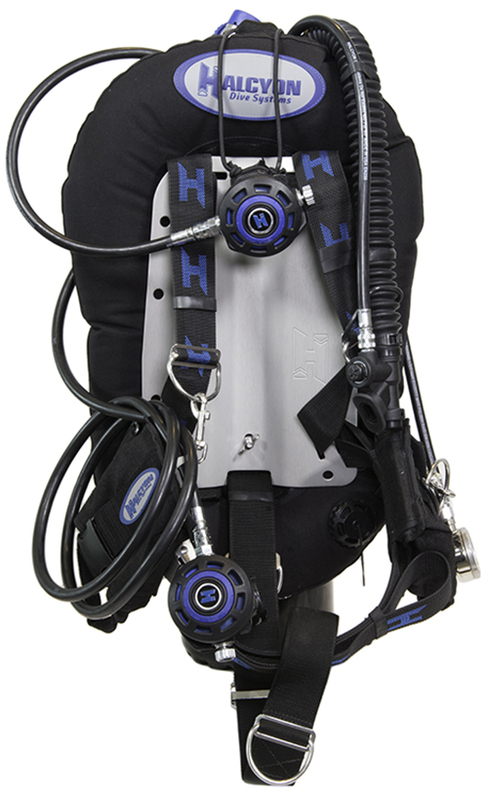 Backplate – A solid base for your diving system with a harness made from a single piece of webbing for more security and a comfortable fit, minimally equipped with D-rings in optimal locations for clipping off your accessories. Supplied with a crotch strap, along with a well-fitted waist band, the backplate allows for a snug and comfortable fit that stays in place on your back regardless of the position you are in or the equipment you attach to it. Wing – Attached to your backplate is your buoyancy compensator. The sleek, simple, streamlined, circular, and back-mounted design allows for easy operation, enables comfortable in-water body positioning (proper trim), and ensures adequate lift capacity. Even fully inflated, it will not restrict your movement or maneuverability. Regulators – Whether a single-tank setup or doubles, the regulator’s configuration stays the same in front of you. The only difference will be what happens behind your shoulders, which will be one first stage for a single tank or two first stages for doubles configuration. The principles, configuration, and application stay the same. Primary regulator with a long hose – The primary regulator you breathe from is mounted on a 7 ft/210 cm long hose that is routed down your right hip, across your chest, and back around your neck. It is the regulator you donate in an out-of-gas situation. Not only are you sharing gas from a regulator you just breathed from (so you are certain it works), but you will have plenty of space and maneuverability to manage the situation regardless of the environment in which you are diving. Backup regulator – Mounted on a shorter hose, under your chin on a bungee necklace so that it is always secure and ready for you use when donating your primary regulator teammate, or in any situation where you need to switch to it from your primary regulator. Primary light – GUE dive teams rely on proper communication, and the primary light is not only a light, but also a tool for communicating due to the very focused and bright beam. A primary light allows you to get the attention of your team without the need of swimming to them. The battery canister is on your right hip and can be used to secure the long hose. Backup lights – Just as with regulators, primary lights need to have a backup in case they malfunctions. The two backup lights in the GUE configuration are simplistic in design, with a rotate-to-switch-on design. They are robust and reliable in any environment that requires divers to carry lights. They are stored comfortably on the harness, ready to be deployed at any time. A much more detailed orientation of both the GUE equipment configuration and its proper application is offered in every GUE entry-level class. Equipment itself cannot compensate for divers’ shortcomings; however, thorough and proper instruction as well as consistent practice will greatly enhance your comfort, enjoyment, and safety.